This salad looks probably more like a meal for summer than midwinter, but it doesn’t take away from the fact that it is healthy and delicious. Some of the ingredients can be served warm on the salad, a poached egg can be added, some crispy warm croûtons. You can serve it on a warm “pain perdu“, or on a bed of warm pasta, or a bed of warm lentils of your choice. Serve it with a warm vinaigrette or a creamier vinaigrette for more substance. I served it here as is with a pungent vinaigrette and a homebaked wholewheat bread, of which I’ll share the recipe later. 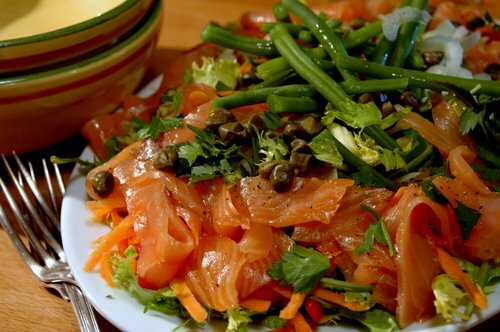 A variety of salad leaves of your choice, sliced celery, available herbs(parsley, chervil, fennel), grated carrot, green beans(steamed until just tender), capers, strips of smoked salmon. Mix the salad leaves in a big platter and top with the carrots and celery. Tear the salmon into strips and arrange on the salad. Finish off with the warm steamed beans, herbs and capers. Serve with the vinaigrette on the side and a dark, hearty wholewheat bread. Vinaigrette: Mix together a chopped shallot with olive oil, a dash of pumpkin oil, sherry wine vinegar and some lemon juice to you taste. I don’t believe in the basic rule of 1 part acid :3 parts oil…I find it too oily for me. I prefer to taste it as I go along, starting with a pinch of salt and my chosen acids and then adding the oil, whisking all the time and tasting. Adding a spoonful of dijon mustard, will quickly turn it into a delicious creamy emulsion. Season with salt and pepper. Absolutely gorgeous! I want to come and eat at your house! Okay, now I’m HUNGRY! Smoked salmon is one of my favourite foods! Oh Ronell, this recipe wins me over! Bravo! Such a lovely combination! I would love to it it with some rye bread. Yum! 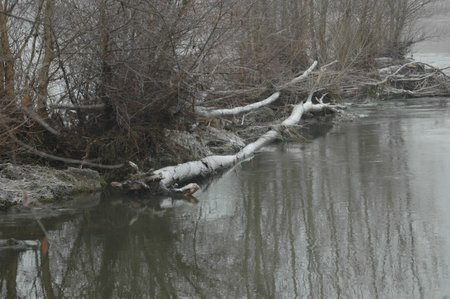 If I were confused about the season, your gorgeous picture of trees in winter reminded me. You just inspired me to run out to the garage to take a whole salmon out of the freezer, so I can make gravlax to use in this salad. It looks delectable. Beautiful. I love how your dishes match the colors of the salad too. I’ve never tried pumpkin oil, I’ll have to get some. Now I’m in the mood for some smoked salmon, since it’s Sunday morning, maybe I’ll have mine on a bagel? 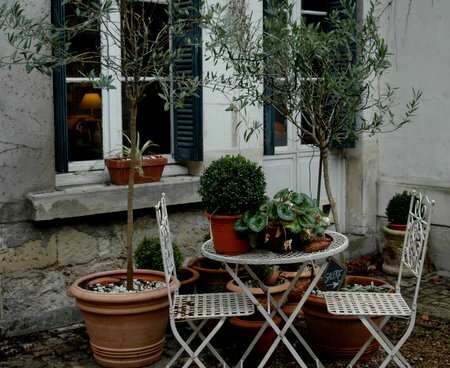 And those outdoor pots are lovely as well. Hmmm…pumpkin oil. I’ll have to look for that. And salad at ANY time of the year is something to celebrate. This salad looks and sounds amazing! 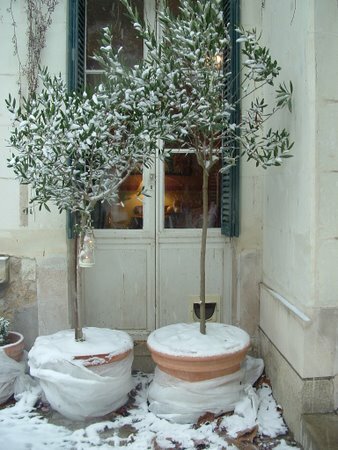 Poor potted trees. I wish we had real weather! It may be a summer type meal, but I am in a summer type mood despite the cold temps outside. I am so ready for winter to be over so I can have fresh veggies from my garden again. Oh I love that salade and salmon looks so good. That looks lovely!! I am such a smoked salmon lover. Do you have a preferred type?